You flick a light switch and light arrives instantaneously. In fact, the light has traveled a path from its source (a lamp, for example) to your eyes. But you cannot see this movement because light travels at a speed of 300 000 km/s (kilometres per second). Yes, per SECOND! Now, what is even more amazing, nor can be seen, is that electricity is traveling in the power network at a speed almost equal to the speed of light. To give you a "clear" idea of this speed, click the images on the left. 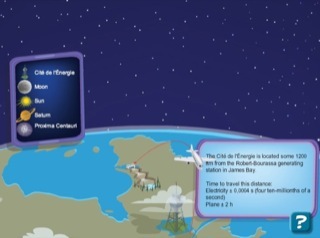 Each animation compares the time needed for electricity to travel a certain distance from the Robert-Bourassa generating station and the time needed for an airplane travelling at 600 km/h to travel the same distance. Main screen of the game. 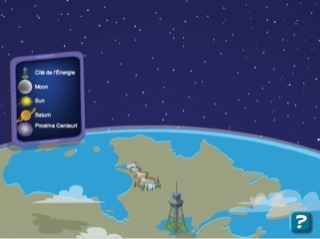 The image represents the Province of Quebec seen in perspective with a star-filled sky in the distance. There is a drawing on the image of Quebec symbolically representing the Robert-Bourassa generating station and the Cité de l'Énergie tower in the foreground. On the left side of the screen is a box containing an illustrated, clickable menu. 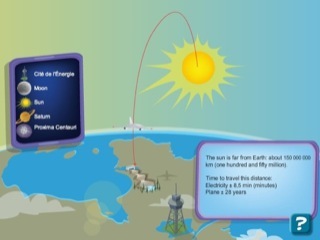 The menu features the Cité de l'énergie tower, the moon, the sun, Saturn and a star. 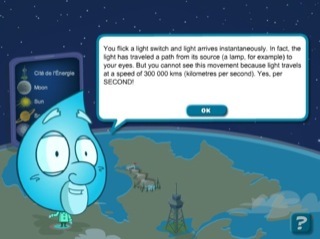 When we click the Cité de l'énergie tower, animation appears. A bolt of lightning and a plane travel towards the tower. Symbolically, we want to represent the speed of light and the speed of a plane. At the lower right, there is a text box. The Cité de l'Énergie is located some 1200 km from the Robert-Bourassa generating station in James Bay. When we click on the moon, animation appears. The sky seems to revolve on itself to make the moon appear. A bolt of lightning and a plane travel towards the moon. 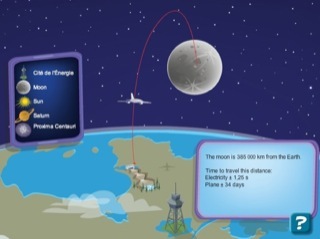 The moon is 385 000 km from the Earth. When we click on the sun, animation appears. The sky seems to revolve on itself to make the sun appear. The sky becomes blue and the stars disappear in the sky. A bolt of lightning and a plane travel towards the sun. The sun is far from Earth: about 150 000 000 km (one hundred and fifty million). When we click on Saturn, animation appears. The sky seems to revolve on itself to make Saturn appear. 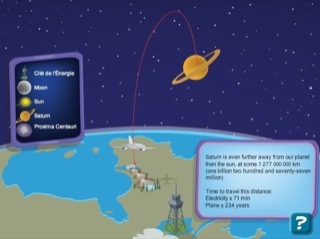 A bolt of lightning and a plane travel towards Saturn. Saturn is even further away from our planet than the sun, at some 1 277 000 000 km (one billion two hundred and seventy-seven million). When we click on the star, animation appears. The sky seems to revolve on itself to make the star appear. A bolt of lightning and a plane travel towards the star. 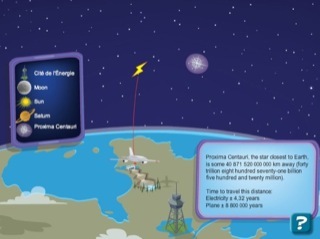 Proxima Centauri, the star closest to Earth, is some 40 871 520 000 000 km away (forty trillion eight hundred seventy-one billion five hundred and twenty million).